The "Spirit Lives On" War Memorial commemorates the centenary of World War One and those who served in the conflict. 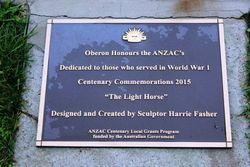 Oberon RSL Sub-branch were awarded $7,000 grant funding under the Australian Government’s Anzac Centenary Local Grants Program to construct the contemporary memorial. 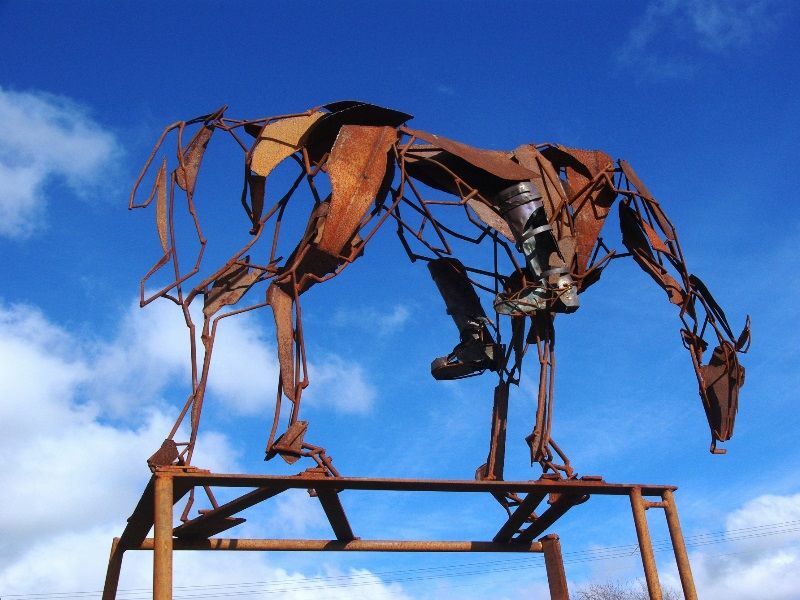 The sculpture is constructed by local artist Harrie Fasher who is well known for her welded rod sculptures of ghost horses. 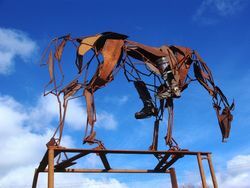 A large crowd gathered at the Oberon RSL Sub Branch Military Museum on Saturday for the unveiling of the Harrie Fasher’s sculpture The Light Horse in commemoration of those who served in World War 1. The sculpture was unveiled after a street parade through Oberon’s main street, which included military vehicles and tanks, RSL Sub Branch representatives and veterans, schools and Rural Fire Service, State Emergency Service and Lithgow Living History Group members. In keeping with Oberon’s link to Eceabat in Turkey, a large group from the Ataturk Cultural Group also attended the parade. Oberon RSL Sub Branch president Bill Wilcox welcomed everyone to the unveiling of The Light Horse, and said since it was mounted there had been a lot of interest from passing traffic.mMr Wilcox thanked Harrie Fasher for her brilliant work and said the monument would be there for many years to come. Mr Wilcox said he was asked by many people why the boots were on backwards. “If a soldier had passed, the boots were mounted on the horse backwards in respect for the fallen soldier,” he said. Acting vice president of NSW RSL Sub Branch Peter Stevenson and Sam Farraway, who was representing both the Minister for Veteran Affairs and Member for Calare John Cobb, attended the official unveiling. Mr Farraway said the project was funded by the Anzac Local Grants Program. 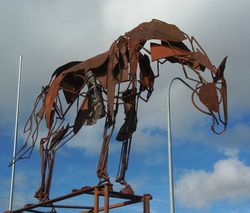 He said The Light Horse was a fitting monument and the community would never forget the sacrifice of the Anzacs. Members from the Ataturk Cultural Group presented the RSL sub branch with a plaque of handmade poppies, and member Hande Honeine presented the branch with a jar of sand from Gallipoli to add to the military collection in the museum. Official proceedings ended with the Australian and Turkish national anthems. Guests then enjoyed the sounds of the Macquarie Male Choir while inspecting heritage vehicles and museum artifacts, including a Poppy Blanket made by many groups in the community and hosted by Friends of the Oberon Library. Children were also given a bag of poppy seeds to be planted in their gardens on Anzac Day to produce the blooms in time for Remembrance Day in November.